Sunday UPDATE: We are good. While we love hate patting our own backs, how 'bout those prognosticating skills? We were off a mere $2M on Non-Stop and $250K on Son of God as both pics are/will soon be winners with respect to their meager budgets. Liam Neeson again delivering with auds who gave his Non-Stop an A- CinemaScore, the same grade given to the latest cinematic rendition of the trials and tribulations of Jesus. Everything makes way for 300: Rise of an Empire next weekend, the prequel + sequel will likely post the second-biggest debut of 2014, as the owner of that mark, The Lego Movie, just passed $200M stateside. 61. Call it 62. Liam Neeson will be that ripe-old age in June, but with his new role as the gun-toting enforcer over the past five years, the Irishman's actioners – Taken, Unknown, The Grey and Taken 2 – have raked over $800M worldwide — Neeson's a certifiable box office draw. 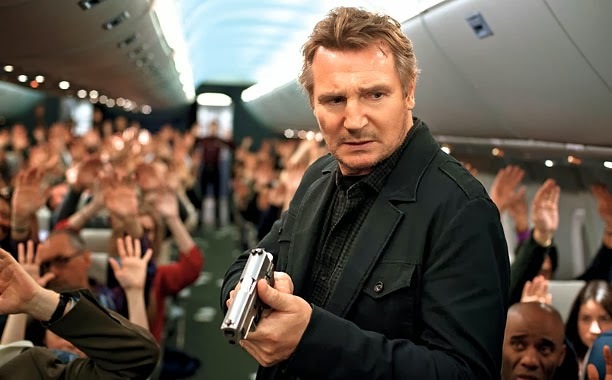 This weekend he takes his AARP card and hits the runway for the umpteenth telling of terror in the skies in Non-Stop, a movie that couldn't look less generic though it has all it needs on the marquee: Liam Neeson. Non-Stop $28M (↓) - Auds are rather bored with the action genre at the moment (see: Jack Ryan: Shadow Recruit and 3 Days to Kill). Can Neeson be the difference maker yet again? Son of God $26.75M (↑) - This weekend's wild – wild – card. Could easily see it surge past $30M or settle in the low $20Ms, religious auds are a devil to forecast. The Lego Movie $19M - Plastic bricks will plow past $200M stateside on Saturday. 3 Days to Kill $5M - Kevin Costner cliff dives after tepid $12.2M debut. The Monuments Men $4.25M - Not a bomb, not a smash. Meh for Sony. Anchorman 2 (Extended Cut) $3.75M - Lengthier version hits 1,300 theaters with jokes that weren't funny enough to make the final cut.